*Edit: All of my initial slots are now filled! Please check back or keep an eye on my Twitter as I will open more later. 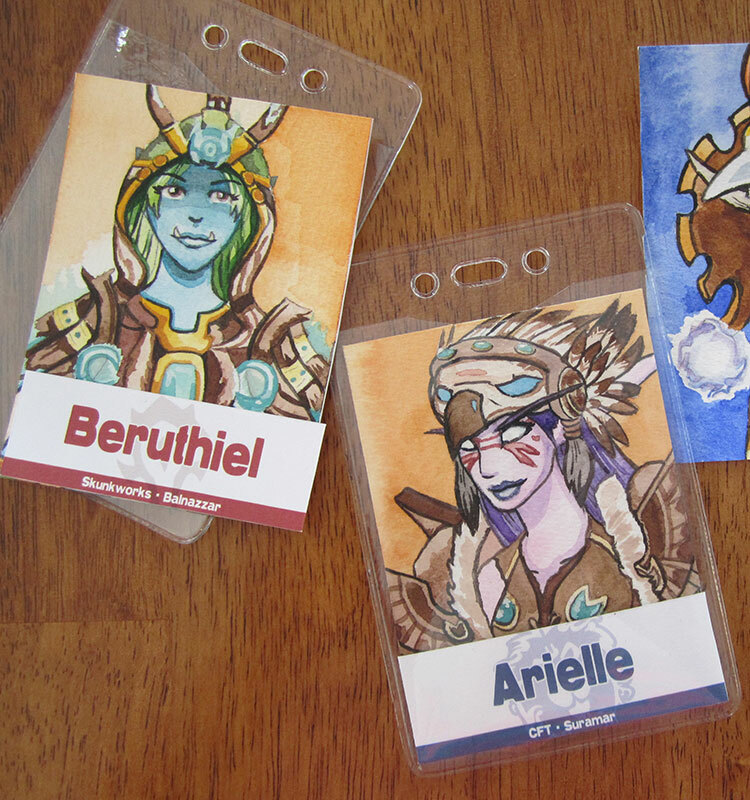 ‘Tis the season for convention badges! 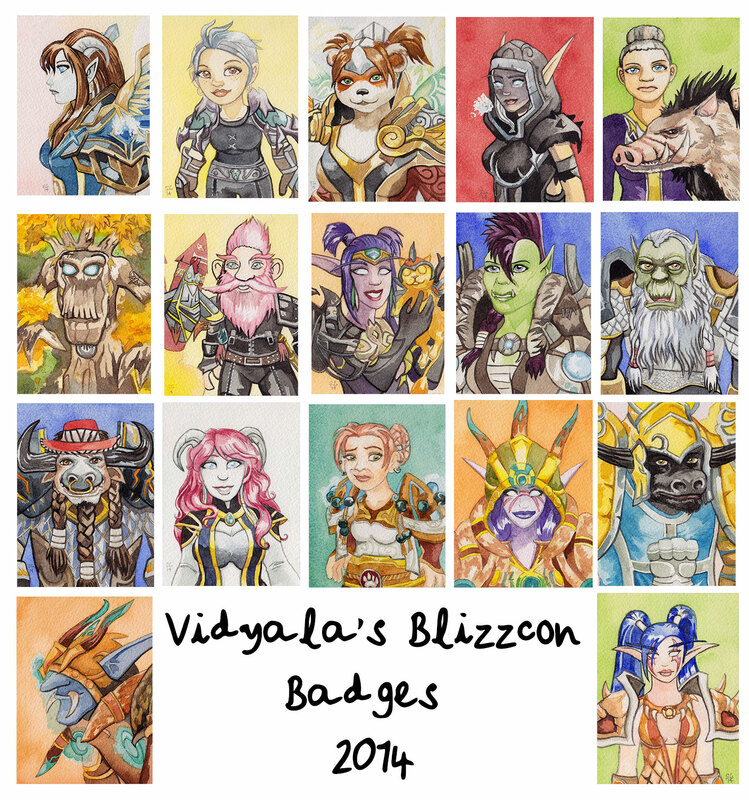 As you probably remember, I’ve done Blizzcon badges for two years now. First I tried my hand at it in 2013, and then continued to do it in 2014. This year, there are a few changes. First, I’ll have options for if a person wants an actual convention badge. The price remains $55 USD as from last year, which includes regular mail shipping. Registered letter mail costs extra. 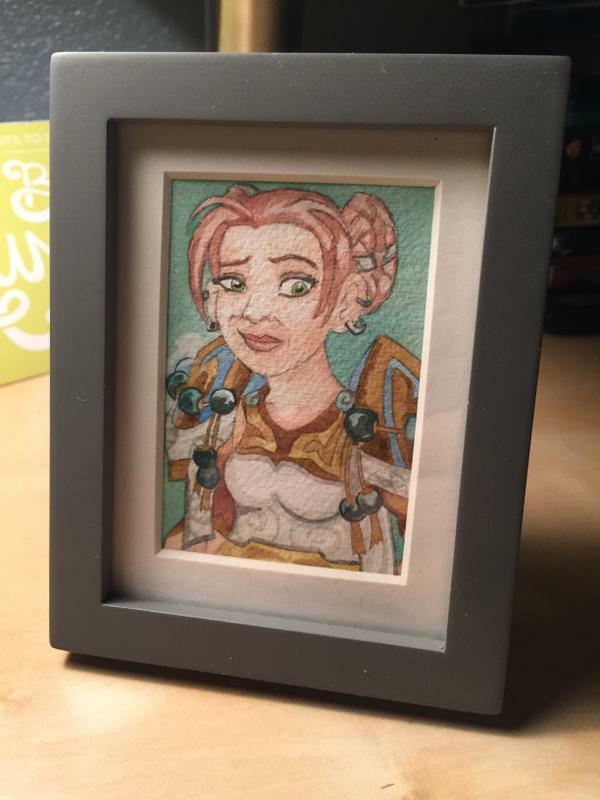 The second option is by popular request, because there are folks who want the painting but aren’t going to Blizzcon. Often they tell me “I don’t want to take a spot from someone who…” No. Your commission is equally valid. And mini painting commissions (same painting, without name tag or badge holder) will be $50 USD so you save a little bit, too. Please note that additional items (e.g. mini pets, hunter pets) are $5 extra. The Godmother created this frame specifically for her painting! This is Beruthiel’s framed painting. 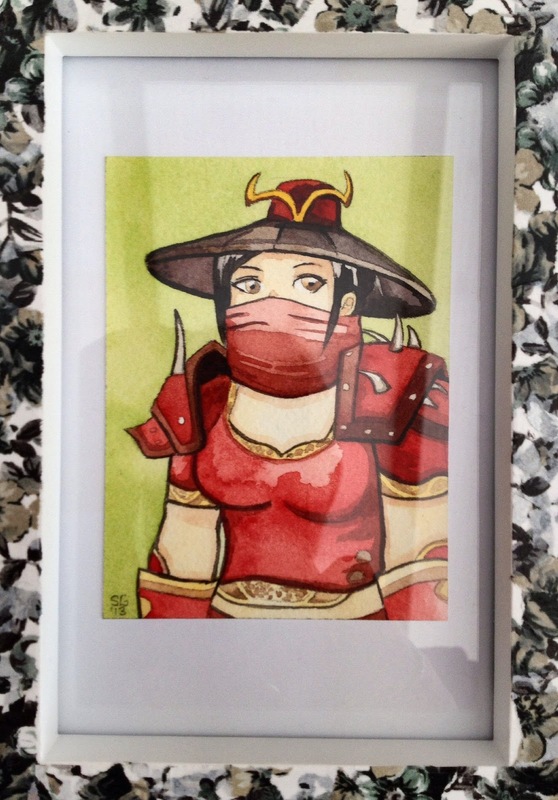 Here’s a photograph of Liz’s framed piece! These are what the name tags looked like formerly. Basically, the only thing you are choosing is your faction, and whether you want your real name on it plus your character name, or just your character name. The next change to this year’s process is that I’ll be taking on commissions in batches, starting out with six. I’ll regularly re-open these when I’m able, and possibly pause or stop them if I have a lot of other work to do. These are a fun side thing that I love doing and I want to be able to give your art my full attention. Here’s what the badges look like physically. 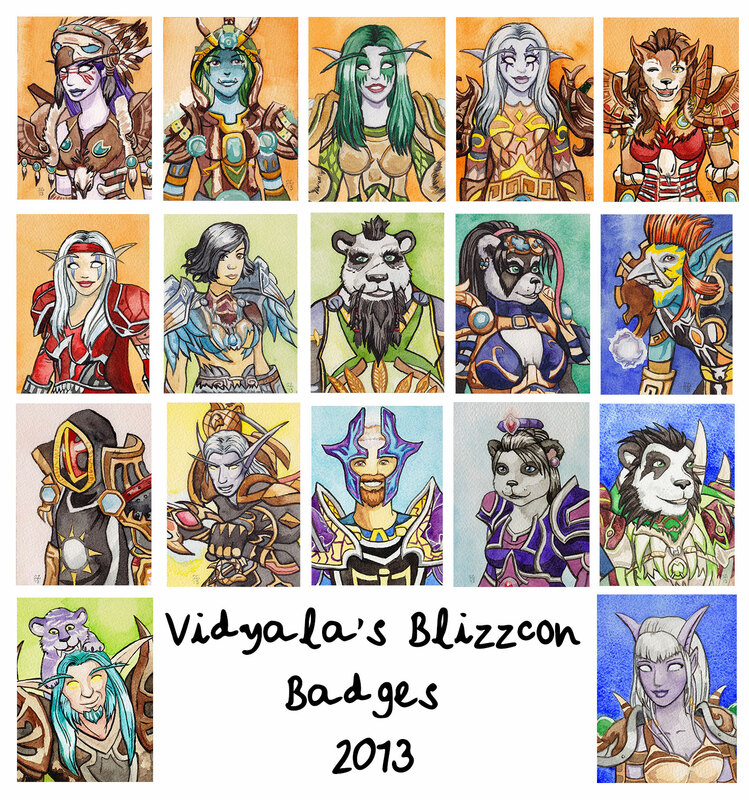 Larger images of many of the badges are featured on my art site, staceylandry.com, if you’d like to see them. 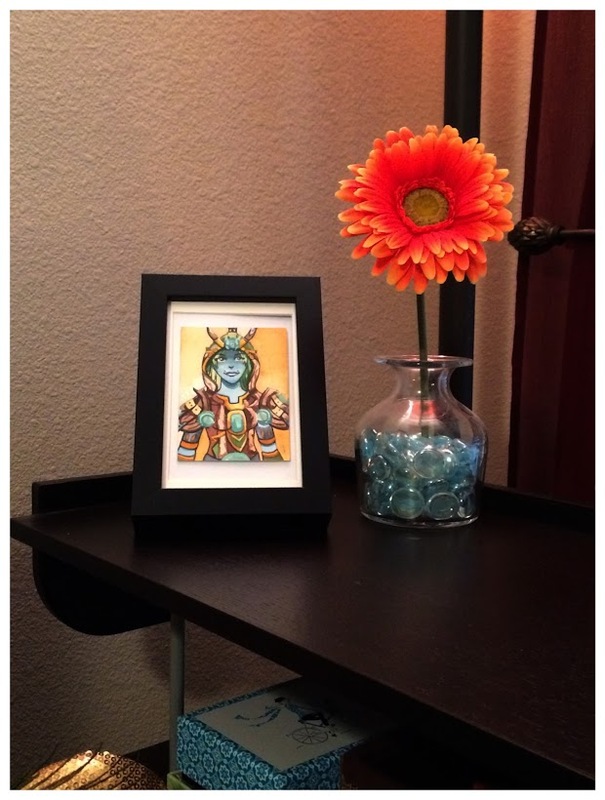 Here’s what to do if you’d like a painting of your own! 1) Fill out this form and submit it. You’ll get an automatic confirmation e-mail. 2) I will e-mail to let you know I received your request (please allow 1-2 business days). 3) You will see your name added to this list. 4) Take some reference shots for your image. I can work from the armory but I prefer shots taken in-game. Please take them in a place with bright, daylight lighting. (e.g. Orgrimmar, most of Pandaria, Nagrand or Talador, not Shadowmoon Valley). As you can see from previous examples, some of the best paintings result from unexpected angles. 3/4 is dynamic for portraits, but I can also do profiles or others. Don’t feel you are limited to just head on/with a neutral expression! 5) Send your references in and clearly label the e-mail with your name/character name etc. so I know who they belong to. 6) When I’m ready to start your commission, I’ll send you a Paypal request. Once payment is received I’ll get started! I’ll send you one sketch image to make sure you’re happy with it, and then I’ll finish the painting itself. Because of the way I do these commissions (I paint several per page of watercolour paper and then cut them out) you won’t receive your painting until I have finished a few more commissions past yours, approximately a few weeks. If you have any other questions, don’t hesitate to ask me here or on Twitter (@_Vidyala). Thanks for your interest in my art.